I have been telling Bible stories since I finished my senior year of Sunday School in Sydney, Australia and after all this time, I think I'm even more enthusiastic about sharing these stories with my classes than I was back then. 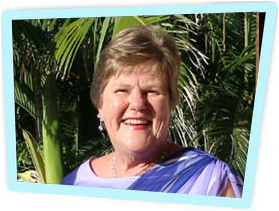 Later when I moved to the Whitsundays in Queensland with my husband, son and daughter it wasn't long till I was in charge of the local Sunday School and not long after, I commenced teaching Religious Education at the local primary school where I taught for 25 years. It is only in the last few years that I decided to put these stories in writing but in that process, I became so engrossed in the research which led me to all that happened in between the well known stories, that I decided to encompass most of the Old Testament and adapt my writing for an adult audience. There is a wide selection of Children's Bible Story books available, but I couldn't find anything suitable for adults, so that is why this is a Bible Story book for big kids! I have also served two terms as a Local Government Councillor, conducted a Children’s Choir and a Community Choir and have been involved in numerous community projects as well as being a partner in our family business. The view from Cannonvale State School must be one of the best for any school as it overlooks the islands and tropical waters of the Whitsunday Passage in North Queensland. For 25 years I taught teaching Religious Education at this school and with my love and enthusiasm for sharing the stories of the Bible and my wanting to make Christianity relevant to the students, I am always encouraged when requested by the staff to "please take my class again next year."